This old Ogden Nash poem keeps rattling around my brain when I think about Christian Lopez, a 23-year-old, the Verizon Wireless salesman. 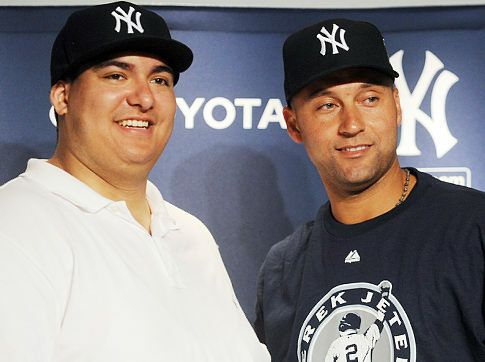 Lopez caught New York Yankee Derek Jeter’s 3000th hit, and big-heartedly gave the ball to Jeter. In return Lopez got from the Yankees four luxury suite tickets for the rest of the season, and three bats, three balls, and two jerseys, all signed by Jeter. There has been talk of the Yankees helping Lopez pay off his several hundred thousand dollars in college loans, as well as the tax bill the IRS is likely to present, since the IRS considers Lopez’s catching the ball to be taxable income. What’s wrong with this picture: a young man, struggling to pay off college loans and support himself with a minimal-paying job, gives a gift—estimated to be worth $300,000 on the open market—to a baseball superstar whose salary for 2011 is $14,729,365? While others may say Lopez’s heart is big, I think it stupid. But is there a pig in the story? How about Jeter, the gazillionaire who accepts a $300,000 gift from a fan who could only afford one of the cheap seats to see his Yankees play? Jeter is widely considered classy. No sign of it in this story. This entry was posted on July 19, 2011 at 11:39 pm and is filed under Ethics-general, Sports. You can follow any responses to this entry through the RSS 2.0 feed. You can leave a response, or trackback from your own site. What he is not saying here is that Jeter, himself, is who has pressed the Yankees to pay off this guys tax bill and student loans. Its a big tradition in baseball for a player to receive the baseball that was used when he achieved something great in the game. It seems that the “ethics” here is only concerned about the money involved. Some things, in my opinion, are more valueable than money. Sure, there are things whose value is immeasurable, but the ball had a value on the market, and a very rich man accepted a very expensive gift from a poor man. That looks like the ugly reverse of charity. The man who caught Mark McGuires hall of fame home run ball gave it to McGuire for free. Its a tradition in baseball. To fans, that tradition is more important than the money. Regardless of value, the general consensus in the baseball community is that whenever a player reaches a great milestone, they should get to keep the ball as a momento of their achievement. When you think about it in terms of money, you can see it as unethical. The problem with that is… you’re not thinking about it the right way. Its not about money, so to make it about money is to disregard the spirit and, consequently, the reasoning behind the action.